GLAND, Switzerland, November 10, 2011 (ENS) – One-quarter of all the world’s mammals are at risk of extinction despite conservation efforts, according to the latest update of the IUCN Red List of Threatened Species, released today. One rhinocerus subspecies has been declared Extinct in the updated list, and other rhino subspecies are teetering on the brink. Plant species, too, are disappearing. 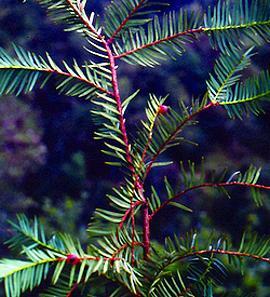 The West Himalayan yew, Taxus contorta, which is used to produce the chemotherapy drug Taxol, has been reclassified from Vulnerable to Endangered due to over-exploitation for medicinal use and over-collection for fuel wood and fodder. The decline is continuing and in many areas will not be reversible, said the IUCN. With more than 61,900 species now reviewed, the efforts undertaken by International Union for the Conservation of Nature and its partners to expand the number and diversity of species assessed represent a big step toward developing the IUCN Red List into a true Barometer of Life, the organization said. The reassessments of several rhinoceros species show that the subspecies of the black rhino in western Africa, the western black rhino, Diceros bicornis longipes, has officially been declared Extinct. These rhinos were once widespread on the central-west African savannah but were wiped out by poachers. The subspecies of the white rhino in central Africa, the northern white rhino, Ceratotherium simum cottoni, is teetering on the brink of extinction and has been listed as Possibly Extinct in the Wild. The Javan rhino, Rhinoceros sondaicus, is making its last stand, as the subspecies Rhinoceros sondaicus annasmiticus is probably Extinct, following the poaching of what is thought to be the last animal in Vietnam in 2010. The Javan rhino is not yet extinct but it is reduced to a single, tiny, declining population on the Indonesian island of Java. A lack of political support and will power for conservation efforts in many rhino habitats, international organized crime groups targeting rhinos and increasing illegal demand for rhino horns are the main threats faced by rhinos. Several conservation successes have already been achieved including the southern white rhino subspecies, Ceratotherium simum simum, which has increased from a population of less than 100 at the end of the 19th century, to an estimated wild population of over 20,000. 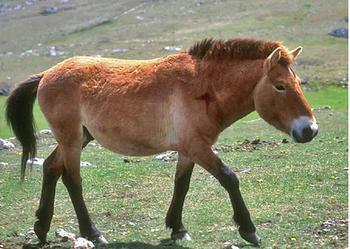 The Przewalski’s horse, Equus ferus, is another success story, improving its status from Critically Endangered to Endangered. Originally, it was listed as Extinct in the Wild in 1996, but thanks to a captive breeding program and a successful reintroduction program, the population is now estimated at more than 300. In recent years, many more reptile species have been assessed, including most of those found in Madagascar the island nation off the southeastern coast of Africa. The updated Red List shows that 40 percent of Madagascar’s terrestrial reptiles are threatened. 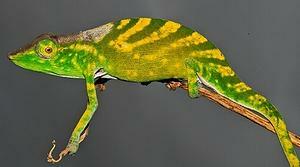 The 22 Madagascan species currently identified as Critically Endangered, which include chameleons, geckoes, skinks and snakes, are now a conservation challenge. This new information helps inform conservation planning and allows for an evaluation of the protection that protected areas in Madagascar offer reptiles. Encouragingly, said the IUCN, there are new conservation areas being designated in Madagascar that will help conserve some of its Critically Endangered species, such as Tarzan’s chameleon, Calumma tarzan, the bizarre-nosed chameleon, Calumma hafahafa, and the limbless skink, Paracontias fasika. Plants are an essential resource for human well-being and are a critical component for wildlife habitats, yet they are still underrepresented on the IUCN Red List. Current work underway to increase knowledge of plants includes a review of all conifers that has uncovered some “disturbing” trends, the IUCN said. 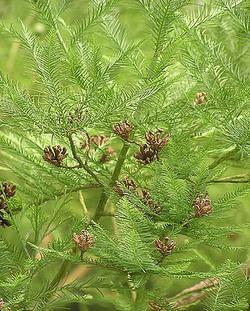 The Chinese Water Fir, Glyptostrobus pensilis, which was formerly widespread throughout China and Vietnam has moved from Endangered to Critically Endangered. The main cause of decline is the loss of habitat to expanding intensive agriculture and in China there appear to be no wild plants remaining. The largest of the recently discovered stands in Laos was killed through flooding for a newly constructed hydro scheme and very few, if any, of the trees in Vietnam produce viable seeds, so this species is rapidly moving towards becoming Extinct in the Wild. “There are 380,000 species of plants named and described, with about 2,000 being added to the list every year. At Kew we estimate one in five of these are likely to be under threat of extinction right now, before we even factor in the impacts of climate change,” says Dr. Tim Entwisle, director of conservation, living collections and estates, the Royal Botanic Gardens, Kew. “The Red Listing process highlights the state of knowledge for some of the critical groups like conifers and is the first step towards understanding and dealing with one of the biggest problems we have to face in the 21st Century – species extinction,” said Entwisle. The majority of endemic flowering plants in the granitic Seychelles islands have been assessed and current studies show that of the 79 endemic species, 77 percent are at risk of extinction. 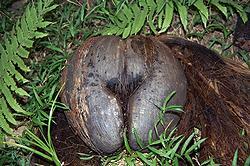 Most of these are new assessments but one species, the infamous Coco de Mer, Lodoicea maldivica, has been uplisted from Vulnerable to Endangered. Known for its supposed aphrodisiac properties, the Coco de Mer faces threats from fires and illegal harvesting of its kernels. Presently, all collection and sale of its seed is highly regulated, but there is thought to be a black market trade in kernels. 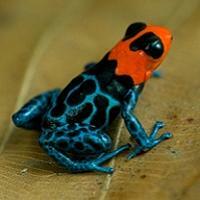 The IUCN Red List keeps pace with scientific discoveries. For example, until recently only one species of manta ray was known, but new comparisons of field observations now reveal that there are actually two species of manta ray: the Reef Manta Ray, Manta alfredi, and the Giant Manta Ray, Manta birostris, both now classified as Vulnerable. The Giant Manta Ray is the largest living ray, which can grow to more than seven meters across. Manta Ray products have a high value in international trade markets and targeted fisheries hunt them for their valuable gill rakers used in traditional Chinese medicine. “Monitoring and regulation of the exploitation and trade of both manta ray species is urgently needed, as well as protection of key habitats,” said the IUCN. The results of the assessments of all species of scombrids (tunas, bonitos, mackerels and Spanish mackerels) and billfishes (swordfish and marlins) were published recently in the magazine “Science.” The detailed results now on the IUCN Red List show that the situation is particularly serious for tunas. 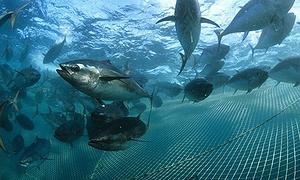 Five of the eight species of tuna are in the threatened or Near Threatened categories. These include: Southern Bluefin, Thunnus maccoyii, Critically Endangered; Atlantic Bluefin, T. thynnus, Endangered; Bigeye, T. obesus, Vulnerable; Yellowfin, T. albacares, Near Threatened; and Albacore, T. alalunga, Near Threatened. This information is expected to inform governments as they make decisions regarding the future of these species, many of which are of high economic value. In January, a single giant bluefin tuna caught in Japanese waters fetched a record 32.49 million yen (US$396,000) at the world’s largest wholesale fish market in Japan. The assessment for the sockeye salmon, Oncorhynchus nerka, found in the North Pacific, was recently reviewed. While the species’ global status remains the same, Least Concern, the assessment at the subpopulation scale shows elevated threats to the species in its North America habitats, with 31 percent of the assessed subpopulations threatened, underscoring the need for continued conservation action. Amphibians form a vital role in ecosystems, are indicators of environmental health, and are literally “hopping pharmacies” being used in the search for new medicines. As one of the most threatened groups, amphibians are closely monitored by IUCN and 26 recently discovered amphibians have been added to the IUCN Red List. The Blessed Poison Frog, Ranitomeya benedicta, is currently listed as Vulnerable and the Summers’ Poison Frog, Ranitomeya summersi, is Endangered. Both are threatened by habitat loss and harvesting for the international pet trade. “The IUCN Red List is critical as an indicator of the health of biodiversity, in identifying conservation needs and informing necessary changes in policy and legislation to drive conservation forward,” says Jean-Christophe Vie, deputy director of IUCN’s Global Species Programme.